This iExpression replaces the source text of a text layer by a randomly generated line of text. Different kinds of text can be generated, e.g. binary numbers, numbers, or random strings using the letters of the alphabet. 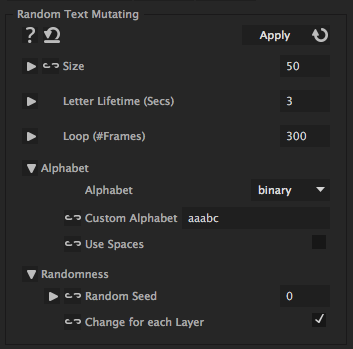 The text "mutates" over time, i.e. individual letters change randomly from time to time. How many letters the text should be long.